It’s been a rough few years for the UC Police Division. But Maris Herold, who came on as Police Chief in January, is already making history: as the first female chief and through the changes she’s implementing. Here, Herold talks applying her work with the Collaborative Agreement and looking at the long-term. Talk about your work at the Cincinnati Police Department. After the civil unrest in the early 2000s, I became a part of the Collaborative with problem solving and I’ll tell you from that point on, the bulk of my career was working with the Collaborative through problem-oriented policing, the community, and training. Problem solving is something I’m passionate about, and I brought to UCPD. It’s a big commitment—a big move from traditional policing. In the aftermath of the Tensing incident, it seems timely, and necessary. UCPD historically was a very traditional, reactive division. And they didn’t rely on data. One of the first things I pushed for was to have our own crime analyst—the first in UCPD history. And I’m using that position in several different ways. One is to understand our data and to relay that to police officers here at UC, and the command staff and the supervisory staff. Then I’m also looking at officer behavior as well, which is very important to avoid what has happened in the past—just not understanding what officers are doing on a daily basis. If you’re not reliant on data and community to deploy, bad things happen. You see that across the country. A lot of these things are avoidable if you [understand] that crime is a science and that crime isn’t random—and we know crime clusters, in very small locations. If you know that as a police administrator and you follow that logic, then you have to get away from just reacting to the 911 system, and you have to start partnering. It’s the ethical strategy, and the moral strategy. What’s the scope of the UCPD and how it relates to the city? We have a huge on-campus population that we provide 24/7 policing to. We are surrounded on all sides by the city of Cincinnati, District 4 and District 5. [When] I was the District 4 Commander, I would come to all the meetings that UC had. I’ve tried to instill that we are just part of this bigger picture that surrounds us. Obviously right now the MoU has been changed where our police officers are not proactively conducting traffic stops on city streets, only in emergency situations. But I have had really good meetings with the new District 5 commander and he has committed a strong partnership, which makes me really happy. I’ve met with Chief Eliott Isaac; he’s been supportive, he wants to play a role with UC in problem solving, I applaud that. And we have to be partners. If not, student safety suffers. What about training and recruiting? We’re under an agreement of voluntary compliance with an outside agency, Exiger. They gave 276 fundamental recommendations, and the vast majority has to do with training. As we sit right now, we are through 70 percent of those recommendations. This police department has been through a constant state of training since we signed that agreement. They needed the training. This was a police division that lacked comprehensive and coherent training models. We are [now] doing some of the most innovative training across the country, and that’s because UC has invested heavily into training. On the recruiting end of it, it is no secret that UCPD is lacking diversity and inclusion. We’ve put a tremendous amount of resources into recruiting. I’m trying to get a very diverse pool of applicants [starting this spring]. It’s important work. 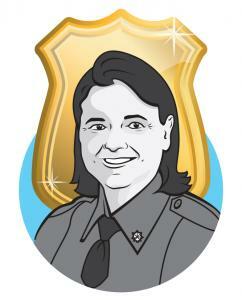 You’re not only the first female police chief; you’re the only woman in a leadership role. Oh yeah [laughs]. We’re lacking women in all ranks. We have a few female officers. I just promoted the first female sergeant, Jen McMahon. She scored number one on the testing process. We keep trying to get wins and keep moving forward. But things like that matter—we are trying to change a culture. I think that you mentor and you encourage people that are good people to take a key position within the police division. She’s really talented at what she does. She was our sexual assault investigator. But the key to Jen’s thing is she’s kind, and she treats people with respect. That means a lot when you’re trying to change the culture. Because she’s successful. I think you can be successful being a kind and good person, and that shows. What are your goals moving forward? One, to complete the Exiger recommendations—for the community to know we did a huge process-improvement and we were successful. Secondly, to do as much as I possibly can to bring some really good, talented officers on, including bringing some diverse populations to the police department. I’m working diligently on that, and so is the whole UC team. And then lastly officer wellness. I really work hard on understanding the police morale issues. They’ve been through a tremendous amount of change over the last several years. So officer wellness becomes a big part of what I’m trying to accomplish here. Organizational change, quickly, coupled with a lot of changeover in leadership at UC, the Sam DuBose tragedy, Ray Tensing—this department has been under stress for a number of years. We are short sighted as leaders if we ignore officer morale. Those three things, that’s what I’ll be working on for the next year.